Are you a boss, or a leader? An aircraft took off for a short scheduled flight. As it climbed to cruising altitude, a blade came away from the left hand engine and caused a fire. There was smoke in the cabin and several passengers on the left side of the aircraft noticed flames and sparks from the left hand engine. The captain and pilot decided (wrongly) that it was the right hand engine – for various good reasons. They shut down the right hand (good) engine and continued to fly to the divert airfield using the left hand engine which was well and truly on fire by now. The captain announced to the passengers and the cabin crew that there was a fire in the right hand engine and they were diverting – nothing to worry about, he said, the aircraft was quite capable of flying on one engine. There were 6 cabin crew in the team and they all knew the captain had shut down the wrong engine. But not a single one of them dared go and tell him. 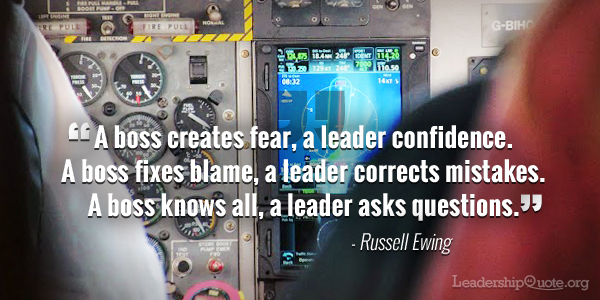 Certain quotes about leadership can remind us of certain stories, and this is certainly one of them. This is no way to run a business. If you’ve heard or read about the Kegworth air disaster, you’ll know that the unfortunate incident ended in a total of 47 fatalities – which could have been prevented if someone had only said what everyone knew was right. You and I should never have people working for us so fearful of questioning us or their colleagues that they dare not tell us if we are wrong. There is a fine line between imposing authority and arousing fear. We can accomplish a whole lot more with a team who speak up than one with a bad case of captainitis. Passive cooperation demotivates the workers, wears out the leader and harms the company – I never fired anyone for telling me I was wrong. That’s a good quote about leadership right there. If you’re leading a bigger unit there will be middle managers within your unit who might be more “bosses” than leaders. And since you cannot and must not be looking over everyone’s shoulder the entire day, these things will go unnoticed. Your team are not statistics. Be close to them so you can get a glimpse of what’s going on. When you’re leading them well, they’ll tell you themselves. However, nobody said this was easy. New employees will be anywhere between two extremes: those who speak their mind immediately and all the time, and those who need a bit of prodding and support from their managers before they speak up. Some people need some time to get accustomed to their new environment, to test the waters and to become acclimatised to the organisation before they decide whether or not it’s a safe avenue for their thoughts and ideas to be heard. Running a company or a department is more or less like running an aircraft. You’re the boss; be a leader. Whether you’re dealing with new colleagues or long-serving ones, It is your job every day to give them that sense of security and confidence without having to compromise leadership, so that they’ll tell you if you have turned off the wrong engine. If you enjoyed reading this post and would like more inspiration, my FREE Quote of the Week newsletter delivers weekly insights and inspiration and inspirational leadership quotes to your inbox – simply fill in your details below.